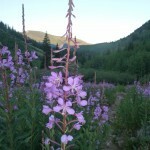 If Purgatory is a ski area near Durango, and Aspen is Purgatory for dirtbags, then Vail is Hell. I arrived tired from the east, wanting only to find a gas station and a place with WiFi, and left defeated. The eastern exit (180) leaves you next to a golf course, a deli and wine store, and some fake-named condominium “communities”; there is also a realtor. The center one (176) dumps you into a maze of roundabouts and non-standard road signs pointing to valet parking and “visitor information” about various boutique-and-condo tracts with names like “Quail Roost” and “The Hamptonmoors.” The western exit is the place to be, with gas stations ($0.40 overpriced), McDonald’s (no value menu), and a grocery store. 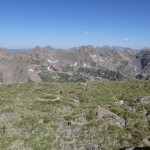 However, Vail is also base camp for the Gore Range (named for some Lord Gore who Jim Bridger took there on a hunting trip), where I have decided to do some quick sight-seeing. Since the Gores are composed of long ridges rather than distinct peaks, I decided to choose a few traverses. Unsurprisingly, Grand Traverse and North Traverse peaks caught my eye. After flailing around Vail for a bit, I slept at the eastern trailhead, then cruised over to the Bighorn Creek one to start the day. Looking at my road atlas and the trailhead sign, I decided to head over and tag Keller Peak first, to make it a bit more of a day. 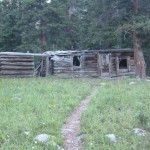 There is an excellent and popular trail up Bighorn Creek to an abandoned cabin. 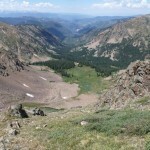 Beyond that, the trail quickly fades out in the tundra, scrub, and bogs, but cross-country travel is easy. 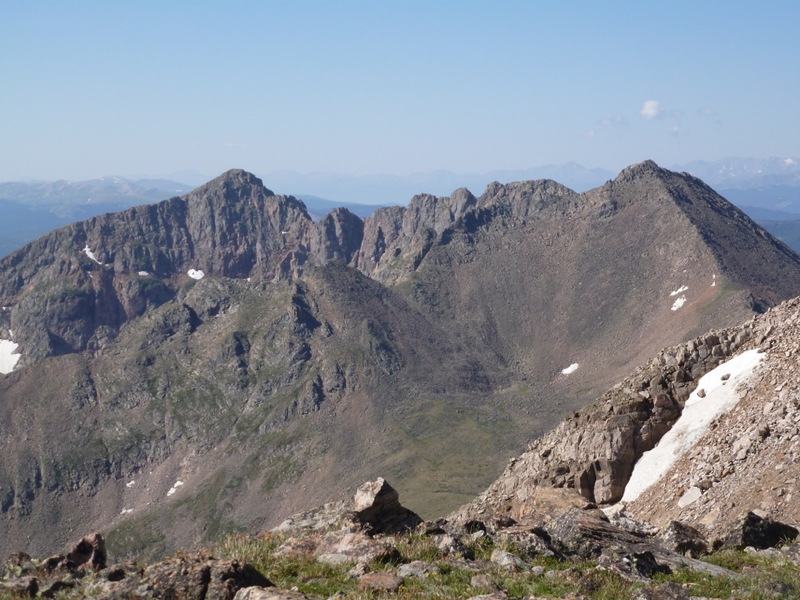 I eventually reached a point west of the saddle north of North Traverse, and headed northeast to where I thought the ridges to Climber’s Point and Keller joined. After a bit of lousy talus and some steep grass, I reached the ridge slightly on the Climber’s Point side, and started traversing around to Keller. The ridge looked short, but only because I was looking at a false summit. The terrain was a mixture of tundra, talus, and mid-angle slabs, with a fair amount of slow going but no real difficulties. 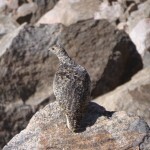 Near the true Keller, I pestered a ptarmigan and her chicks. They scattered, and she ran around and fluttered, making plenty of noise. After checking out another high-point north of Keller, I found the register canister on my way back, holding a SummitPost print-out with a few familiar names. 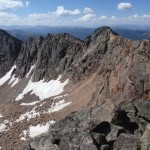 One long traverse later, I finally reached North Traverse Peak. 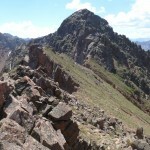 The ridge is mostly a good traverse, with the path of least resistance on or near the crest for the first part. However, north of the low-point, it is mostly just a walk. From the low-point, the easiest path skirts the pinnacles to the right (west), apparently continuing the class 2 walk. However, I uncharacteristically made my life harder by crossing over most of the pinnacles, and was rewarded with some legitimate 4th class climbing. The rock is mostly good where it counts, but I did encounter a few loose blocks in unfortunate places. 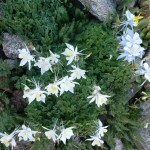 I reached Grand Traverse’s summit by a short, mandatory 3rd class scramble. 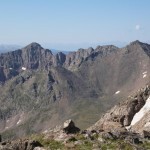 While contemplating the nasty talus slope south to a lake — the standard descent route — I darted glances at an unnervingly tame mountain goat who apparently wanted a handout. 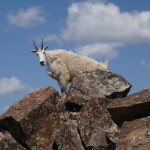 Without an ice axe, I’m not sure how I would have fared against his horns, but he fortunately kept a polite distance. 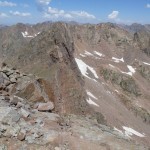 Rather than descend to the lake, then jog a mile of road in town to get back to my trailhead, I followed the southwest ridge to a saddle, then dropped back into the Bighorn Creek basin, staying right to avoid cliffs. This worked well, and with one short section of tricky bushwhacking, I reached the clearing near the cabin and regained the trail, then ran past some tourists to the trailhead.